Well being part of #AccessAllASOS is just fab. I'm not the biggest fan of reading books, but when it's to do with fashion. Count me in. Errr so... bad reviews.. maybe just the people who don't like Alexa Chung but choose to read a book about her. I suppose we're all entitled to our own opinions. Caption not necessary for the last picture - Alexa Chung summed up in one. I've just read it in an hour. That is a life time record for me. It's so easy to believe everything you read in the media so when you read a book like this it's quite reassuring that all the celebrities who are looked up to by so many are actually normal people just like all of us, kinda, sort-of. Just a bit cooler I guess. 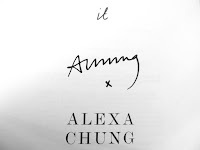 Any how, if you're debating on whether to buy the book, you like Alexa and fashion, then you should get IT.